Biotinylated Human CEACAM-1, His Tag (CE1-H82E5) is expressed from human 293 cells (HEK293). It contains AA Gln 35 - Gly 428 (Accession # P13688). The protein has a calculated MW of 45.9 kDa. The protein migrates as 66-115 kDa under reducing (R) condition (SDS-PAGE) due to glycosylation. 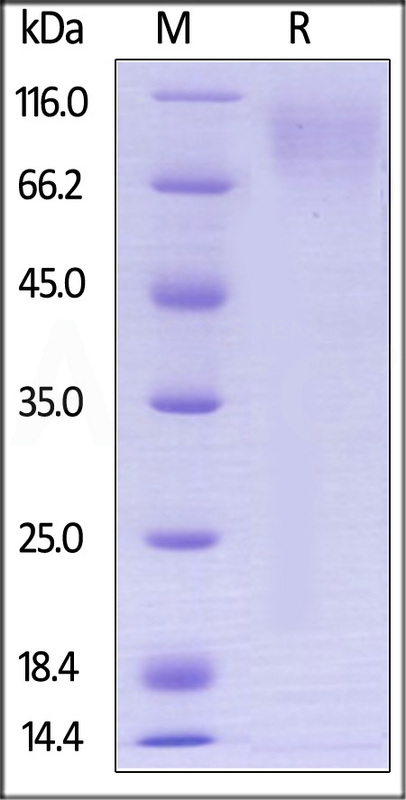 Biotinylated Human CEACAM-1, His Tag on SDS-PAGE under reducing (R) condition. The gel was stained overnight with Coomassie Blue. The purity of the protein is greater than 95%. Carcinoembryonic antigen-related cell adhesion molecule 1 (CEACAM1) is also known as Biliary glycoprotein 1 (BGP1), CD66a, which belongs to the immunoglobulin superfamily or CEA family. CEACAM1 /CD66a contains three Ig-like C2-type (immunoglobulin-like) domains and one Ig-like V-type (immunoglobulin-like) domain. CEACAM1 /CD66a was described as an adhesion molecule mediating cell adhesion via both homophilic and heterophilic manners, and was detected on leukocytes, epithelia, and endothelia. Studies have revealed that CEACAM1 / BGP-1 performs actions in multiple cellular processes including tissue differentiation, angiogenesis, apoptosis, metastasis, as well as the modulation of innate and adaptive immune responses. (1) Kuroki M., et al., 1991, Biochem. Biophys. Res. Commun. 176:578-585. (2) Watt S.M., et al., 1994, Blood 84:200-210. (3) Chen R., et al., 2009, J. Proteome Res. 8:651-661. (4) Hoek KS., et al., 2008, Pigment Cell Melanoma Res. 21 (6): 665–76.